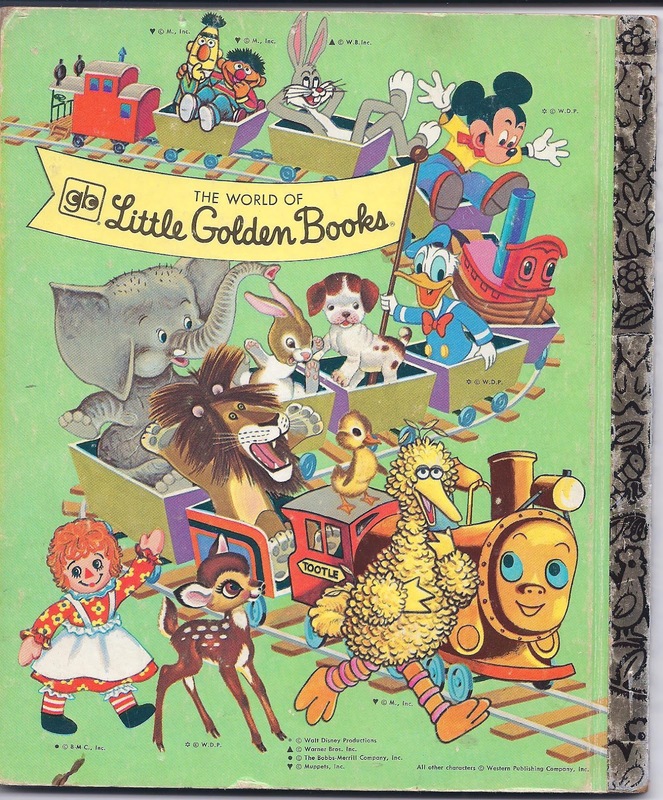 I was sitting in my office, more or less minding my own business, when a office visitor, actually someone from an insurance company checking on our fire extinguishers and such, mentioned that she liked my collection, especially the Little Golden Books. 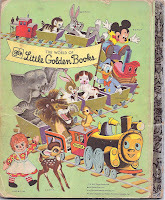 In fact, she (Beth Aroyo-Mirowsky) said that she had a collection of Little Golden Books! It turns out that there is a whole subculture of people collecting Golden Books such as Little Golden Book Collector and The Santis, Like many collections, the value seems to be that for many people, it reminds them of their youth and appeals to their nostalgia for happy days when their paretns read to them..
Once I pulled my jaw back into place, I tookthe opportunity to pick her brain about the Little Golden Books. We have about 50 Golden Books in my educational collection which she looked through. There were five that she said were noteworthy and collectible. For instance, I have a Little Golden Book called: "The Chipmunks' Merry Christmas" which is dated 1959. This book seems to be noteworthy for a few reasons. 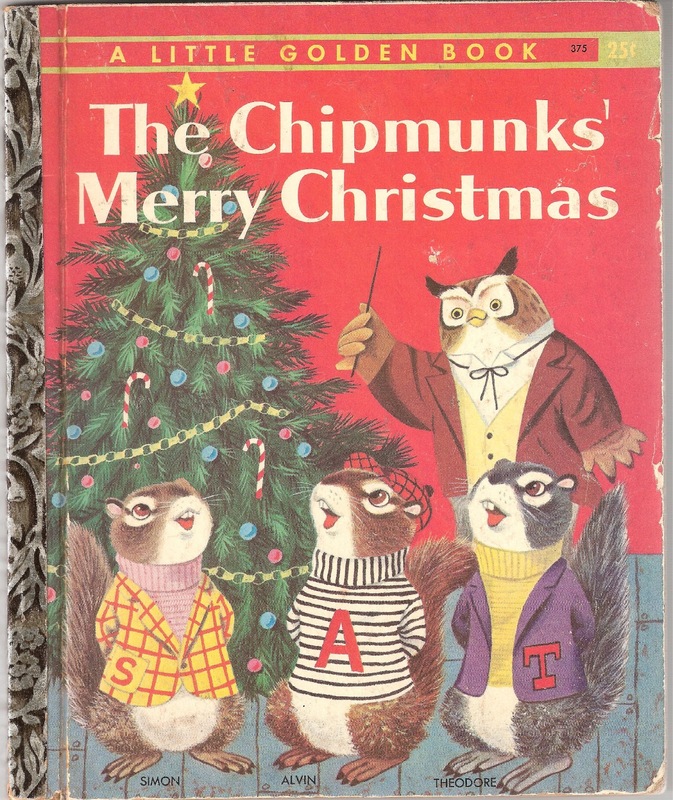 It is an early appearance of the Chipmunks (See their sweaters? Alvin, S? and T?). The price tag was $0.29. 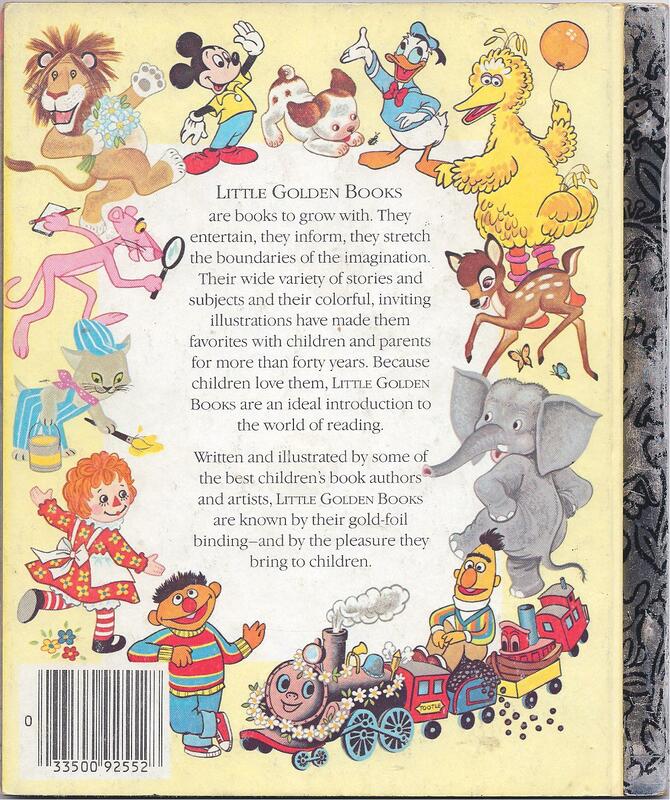 And the book was illustrated by Richard Scarry! Richard Scarry, in case you don't know, became a well-known children's author and illustrator best kown for Busy Town. He peaked in popularity in the 70s, 80s, and 90s. I think in the 50's he was still relatively unknown although he was already 40 in 1959. 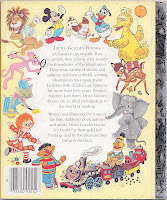 I continued to look through my collection of Little Golden Books and I became intrigued by the elaborate artwork on the back covers. They are amazing in a few ways including the breadth of characters represented. I see Big Bird from Sesame Street Productions; Mickey Mouse, Bambi, and Donald Ducks from Walt Disney; Bugs Bunny from Warner Brothers; and Smokey the Bear from....(Gosh, who owns Smokey, the US Park Service)? 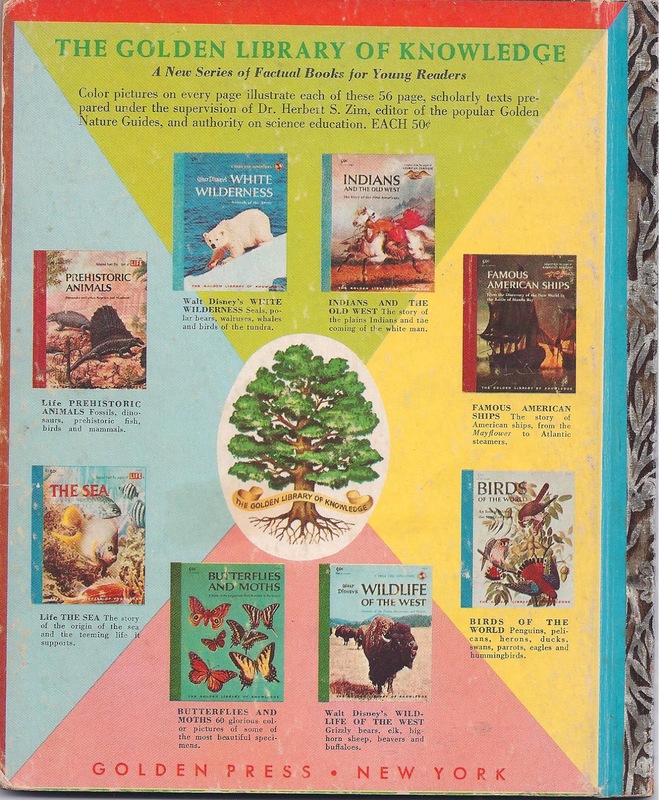 Here's a few different Golden Book back covers. 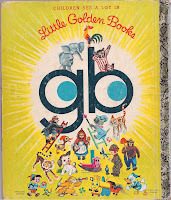 Golden Books was founded in 1942 and was led by the Bank Street Writer's Association which later evolved in the Bank Street School of Education. 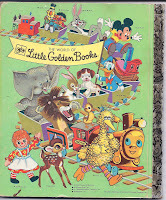 Golden Books are still published today and greatly resemble the originals. They belong to Random House. 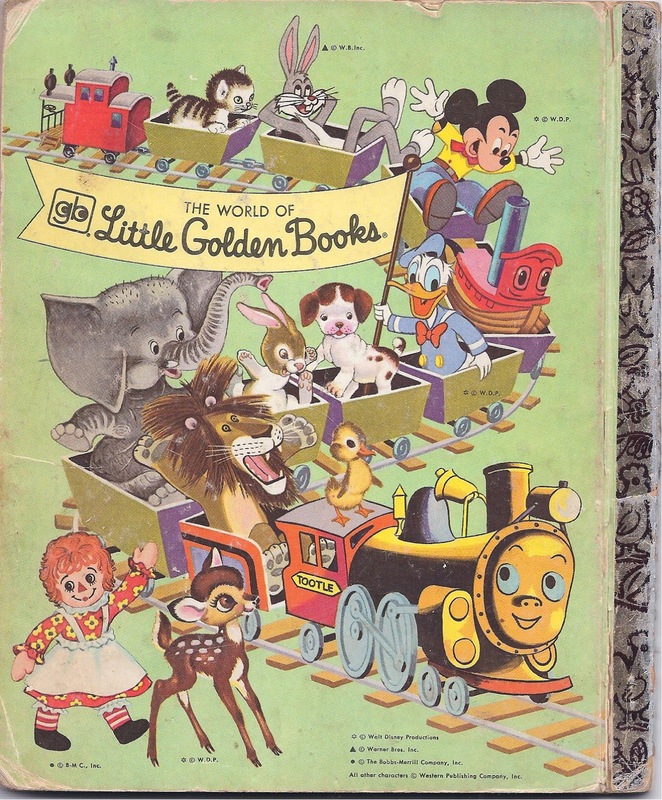 This blog also has an article about the Big Little Books, a type of book introduced in the early 1930s. 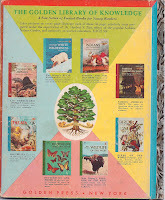 And there's an article about Encyclopedias and Dictionaries (especially the World Book Encyclopedia). S is Simon. T is Theodore. Wow! Those don't even look like the Chipmunks we know now. Those children books are really amazing. It is interesting to note that the Chipmunks remain popular even up to date. Thanks a lot to the author for keeping children entertained through out the years. 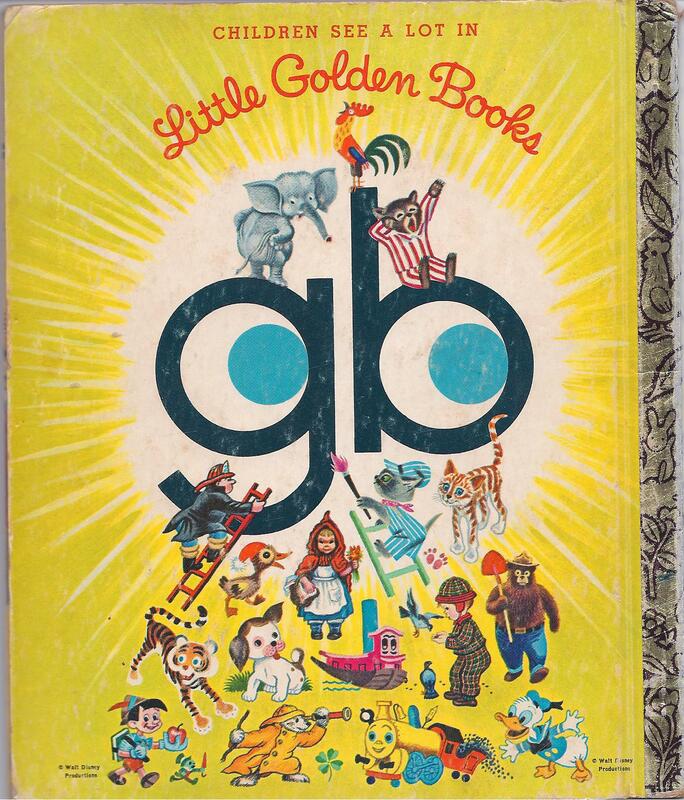 Looking for a book that I am pretty sure is a Little Golden Book about either Love or Friendship. I can't seem to remember the name. If anybody can help I would appreciate it. Educational Technology: 2012 or 1972?